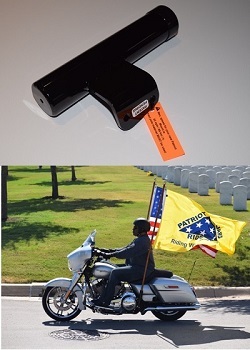 The New line of Patriot Mount units are unique Patent Pending motorcycle flag mounts that allow Harley-Davidson riders of FLH, FLT, FLH Trikes, FLRT Freewheeler Trikes to fly larger 2 ½’ x 4’ or 3’ x 5’ flags from their bikes or trikes, with better performance and safety features than other available flag mounts. No drilling or changes to your motorcycle are required. Your New Patriot Mount fits directly to your bike or trike utilizing the existing frame bolt holes of rear passenger footpeg or footboards of your FLH, FLT, FLR motorcycle or trike to include the FLRT Freewheeler. Calculated fall-away angles built into the Patriot Mount keep the hanging flag away from you and your cycle during stops and full flag-waving operation with no interference to the operator. Easy on and off mounting features allow you to install or remove the mount at a moment’s notice when a passenger wants to ride. Installing other mounts can change the appearance and drivability of your cycle. Patriot Mounts are made of steel and offered only with a quality high gloss black powder coat finish. This offers you, the customer, several options. You can utilize the mount in its original finish -- or should you choose to have the mount chromed or powder coated -- you have that option at customer's expense at any time to do so in your local area. From David Weeks of Inverness, Mississippi on 2/13/2019 . Looked long and hard for a way to fly my 3x5 flags since buying my Harley. I didn't want to go with a hitch and didn't want to do something to take away from the bike's appearance. These are WELL made and fit perfectly. Easy installation. Looks great and Highly Recommend these. Happy Rider! From Jeremy Cherry of Webb city, Missouri on 7/2/2017 . ordered the right side mount to try it out. Quick and easy install. Looks great on the bike, and I have tried it out up to 55 mph with a 3'x5' flag and had no issues. I am definitely ordering the matching left side. Response From Patriot Guard Riders: The PGR store does not manufacturer this product. Please call Patriot Mounts at 1(210) 854-1430 before ordering if you have questions regarding your bike. We have provided the information that Patriot Mounts has provided us in regards to what motorcycles this product will work for. 2/3/2019 – Do you make them for Indian Motorcycles? 11/26/2018 – I have a Harley-Davidson FLHR with a Roadsmith trike conversion. It has the stock passenger running boards. Can I use these . . . Response From Patriot Guard Riders: Yes. These mounts replace the passenger footboards and if your conversion did not alter the area around the boards, it should bolt right up! 8/17/2018 – Any plans to make this for a "Softail" models ? 8/9/2018 – Does this holder replace the passenger floorboard? Or can the passenger still ride? Model Years Marching Left Kit Marching Right Kit Lt. & Rt. * This application side was originally offered with header-over starter exhaust pipe for left side. If your model has been changed to cross-under or aftermarket pipes that clear the marching left side, #1776002L can be installed here. Please call Patriot Mounts at 1(210) 854-1430 before ordering if you have questions regarding your bike on this side of the application. Because of the low profile design of the mounts and possible speeds on missions, Patriot Mounts LLC recommends only quality flagpoles be used with these mounts. Neither Patriot Mounts nor the Patriot Guard Riders sells "highway speed" flagpoles, but Patriot Mounts has an article on how to build your own flagpoles. That article can be found at www.patriotmounts.com/making-your-own-quality-flagpole.